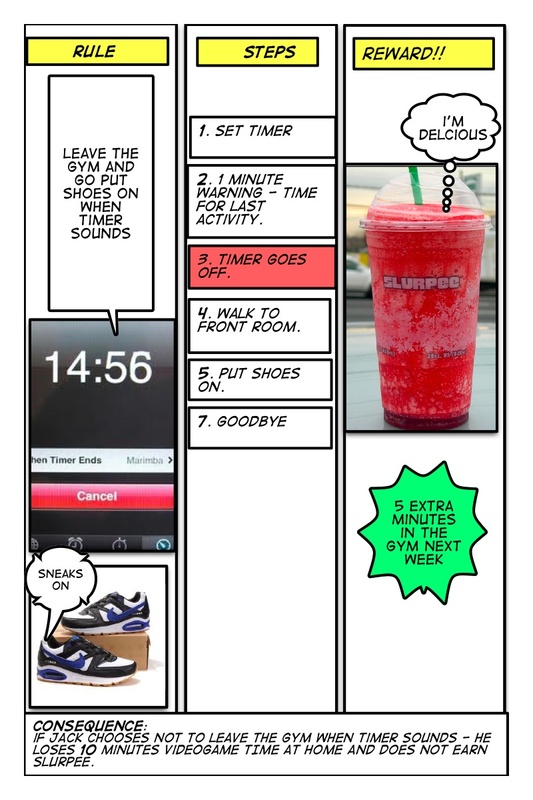 I created this simple incentive-behavior plan after seeing a pattern emerge with a client who doesn’t like to leave the gym when it’s time to go home. This is a simple visual way (using the steps) to help stop this behavior from becoming a full-on pattern. The incentive is emphasized while the consequence is less in the forefront (do not avoid reviewing the consequence). Remember that best results come when we reinforce positive behavior by making it feel like a rewarding choice not an avoidance of punishment. “Comic Life” is the free-to-download program I use to create these fun visuals. Available on both mac and pc. This cartoon was done with a young boy who struggles allowing himself to be emotionally vulnerable in front of others. In his case, he has a great deal of anxiety around his relationship with his mother and his belief that she will “leave again” (his mother was not present in his life for many years). In a session like this, I begin by using a “parallel” story approach – this is where i create a fictional “other” child who has a very similar story/experience to the child in front of me and then ask the child for advice (“he could really use your help…do you know what he might be feeling?” or “I don’t understand…can you help me better understand what he might be feeling?”).This often gives just enough distance/protection to allow the child to open up and talk about thoughts that are causing worry. I then start recording these thoughts in a visual way (cartooning on my white board) for the child to see and reflect on. 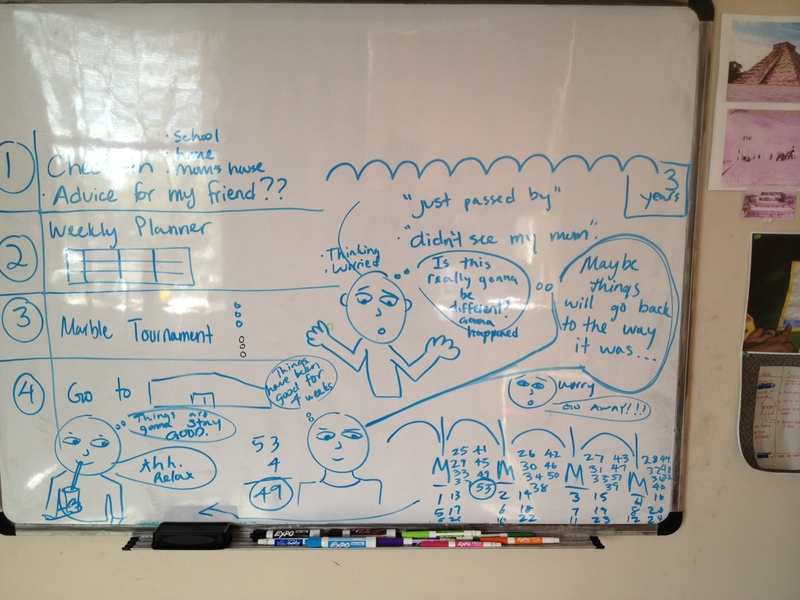 In this boy’s case, this was a great way for him to share his worries with others (so his caregiver could better understand his thought process), organize his thoughts, share what works for him when negative thoughts arise (coping skills), and articulate a clear pace for how long it will take for his worry to dissipate (to trust mom again). In this boy’s case, he shared that it will take “53 weeks” of seeing his mother every weekend before his worry thoughts (“she’s going to leave again”) go away. This was particularly powerful for his caregiver, who now has much greater awareness of this child’s thought process and can now normalize and validate/target these insecurities more directly. I will present another cartoon soon that will display how cartooning can help explain expectations to children who struggle with verbal comprehension. Why do we have an IEP meeting? What can parents expect at an IEP meeting? What are some things a parent should do to prepare for an IEP meeting? How can a parent convince a school district to provide appropriate services? What are some things parents should not do at an IEP meeting? What if the parent and school district do not agree on what is best for the child? BEFORE YOU CONTINUE READING – PLEASE READ PREVIOUS POST. 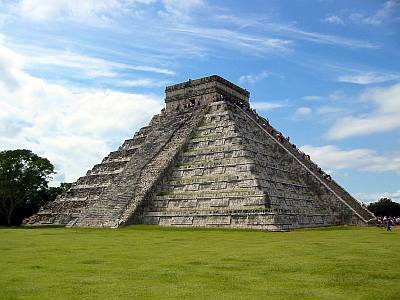 This is Chichen Itza (A Myan City in Mexico the boasts amazing Pyramids). I climbed this pyramid when I was about 10 years old with my dad. 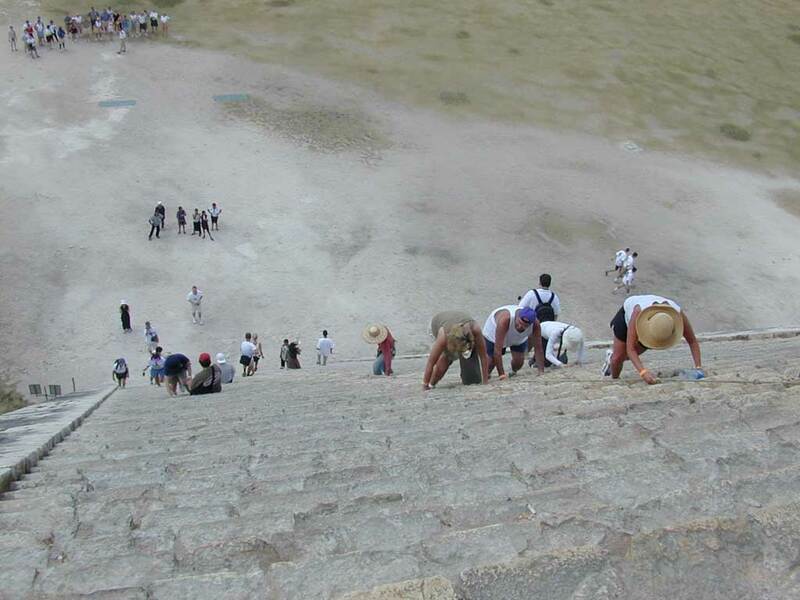 Anyone who has climbed this pyramid or one like it knows that as you ascend, it feels as though the steps are getting steeper. So much so that climbers begin to climb with both their hands and their feet. Lucky for me, I discovered on this trip that I was scared of heights. The higher I climbed, the more paralyzed my body became. When I finally reached the top, I was so frightened I was immobilized completely. After a few breaths and a lot of reassurance from my father, I started to creep closer to the edge to make my decent. My father said the following words, “I’ll be in front of you the whole way. When I take a step, you take a step…We’ll get down one step at a time”. Although my descent was painstakingly slow, and I more slid like a snake than climbed, I was able to manage the overwhelming task by simply breaking it down into manageable steps (with my father’s coaching of course). I remember repeating the phrase “one step” to myself until I felt my foot hit the ground. When we thinking about overcoming anxiety, this “one-step at a time” concept is crucial. As parents/practitioners, we need to be the coach that reassures the child but we also have to be the strategists. In periods of panic, your child will not display rational thought. If nothing else, remember to stay calm and to guide your child through a scary activity/task one small step at a time. 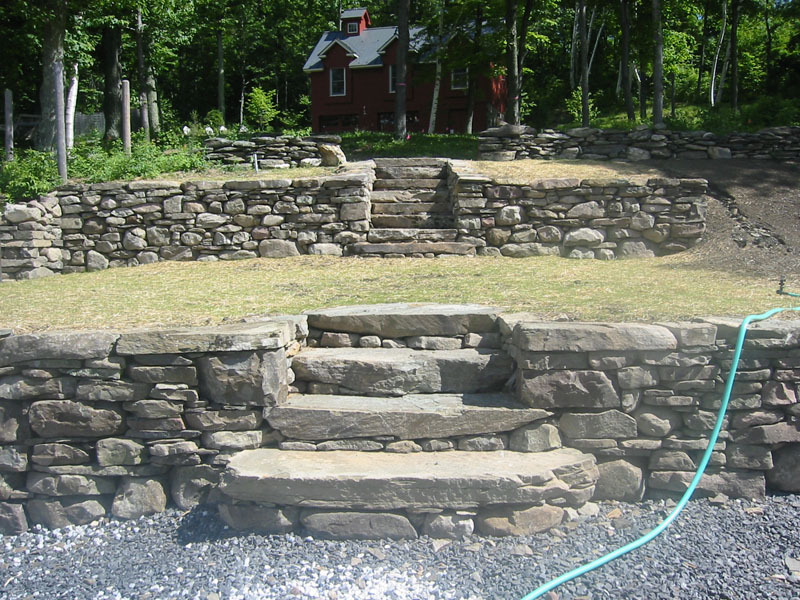 By doing this, you will not completlely eliminate the fear (or replace the image of the daunting pyramid), but you will provide an alternate image that just might give them the courage to persevere.